Envinate is easily one of the hottest, most insta-bragged producers from any corner of the globe that's on the market right now. The team of talented winemakers behind this project are discovering lost plots of indigenous varietals in Galicia and the Canaries, and turning them into absolutely singular expressions of each unique terroir. The idea is somewhat easily explained, but the resulting magic in the glass is almost impossible to communicate. Like all truly great creations, it has to be experienced first hand...but I'll give it my all, as usual! 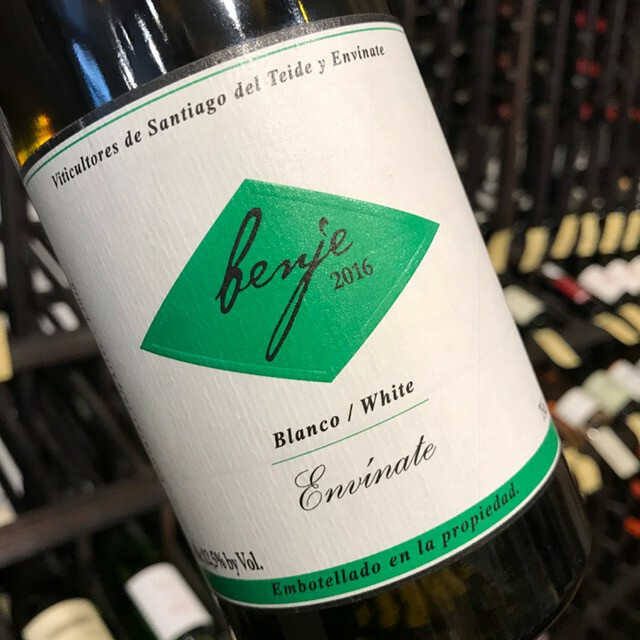 I'll start by saying this - the Envinate Reds are enjoying all the hype (and deservedly so), but today we're going to talk about the whites...or one white in particular, the Benje Blanco 2016. Sometimes a wine comes along that really requires you to shift your mentality to get a grip on, and, for me at least, the Benje is one of those. Part of that is because all of the whites from Envinate are very reductive in style and are quite firm and imposing in the early stages. When you first pull the cork, they tend to be a very closed, offering a rather stern, one-dimensional type of fruit, with only hints of nutty minerals lurking at the edges. But as the air time increases (and were definitely talking hours here), they begin to coalesce into something profound. And so, this Benje will definitely leave you scratching your head if you pull the cork and dive right in. But, with ample air time, it's a completely different experience. Made of 100% Listan Blanco from several parcels located in Santiago del Teide on the Western end of Tenerife, this is easily the most unique white wine I've had in quite a while. ...it's salty...and I mean that in all the best ways. If you think a good Santorini or coastal Italian white can be briny, just wait until you try this. And then you go into it wanting that light, bright coastal-white freshness, but this wine won't give it to you. It's almost as if it's toying with you, offering glimpses of what it knows you want it to be, but then it yanks you in a different direction entirely. That straight-up sea-saltiness, along with all of the of the other elements I mentioned, combine to create of the more uniquely savory white wine experiences you'll have. The shape-shifting nature of it, ducking in and out of being a fresh white, a deep, rich white and a borderline Sherry, is perspective changing. I can't wait to see what this wine tastes like a few years down the road.